Six times a year we invite qualified teams from over 130 regional rounds to join us at Global Rounds that bring together our entire worldwide community. 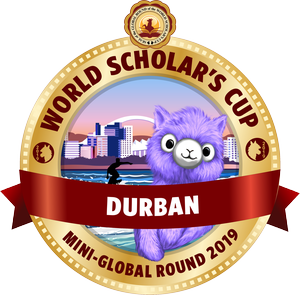 The Mini-Global Round in Durban (September 23-27) will be centered at the Playhouse Drama Theatre, just across the street from Durban City Hall, in one of the world's most beautiful seaside cities. Our hope is to offer a more affordable and accessible Global Round experience to qualified delegations that may not have been able to join us at one of the larger Global Rounds earlier in the year. Just as at the larger Global Rounds, you’ll experience scavenger hunts, keynote speeches, panel discussions, our signature Scholar’s Ball, and, of course, all the competitive and community-building events that drew you to the World Scholar’s Cup in the first place, from the Debate Showcase to the Scholar’s Bowl. Just as at our other Global Rounds, many of the top teams will earn invitations to our annual Tournament of Champions at Yale University, and participants will learn, debate, and build new friendships among fellow scholars from all over the world. We encourage all participants to stay at the Royal Hotel, adjacent to the main venue. Bookings can be made by contacting Sales Manager Liverne via email at [email protected]. If you qualified for the Global Round at a regional round and now need an official letter of invitation to show your school or potential sponsors, please email us at [email protected]. An invitation letter for visa purposes will be sent only to those delegations that have registered and paid the registration fee. Can't make it to Durban? Learn more about our Astana and Manila Mini Global Rounds! Held in July and September, both rounds offer the same events and Tournament of Champions qualification opportunities as Durban. Scholars can also choose to join us at our Beijing, The Hague, and Sydney Global Rounds! Are you from a country looking to join us for the first time? Email us to request a special exceptional berth and other assistance.